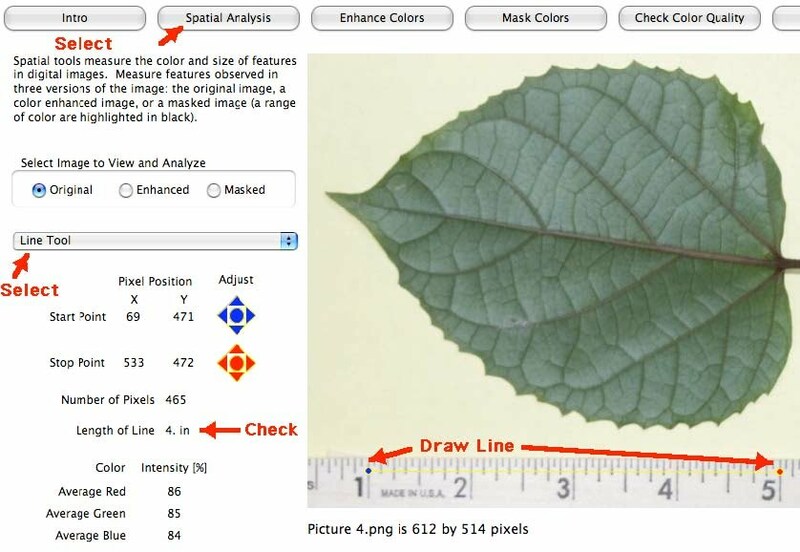 There are three ways to measure the area of objects in digital images using tools in the AnalyzingDigitalImages software: Rectangle tool, Polygon tool, and Masking. 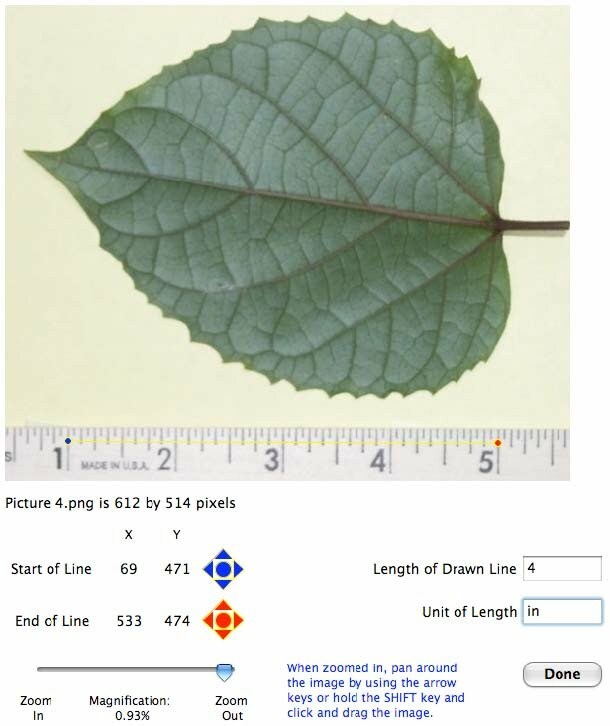 • Plant Leaf image (or any image including an object of known size, such as a ruler to determine scale. 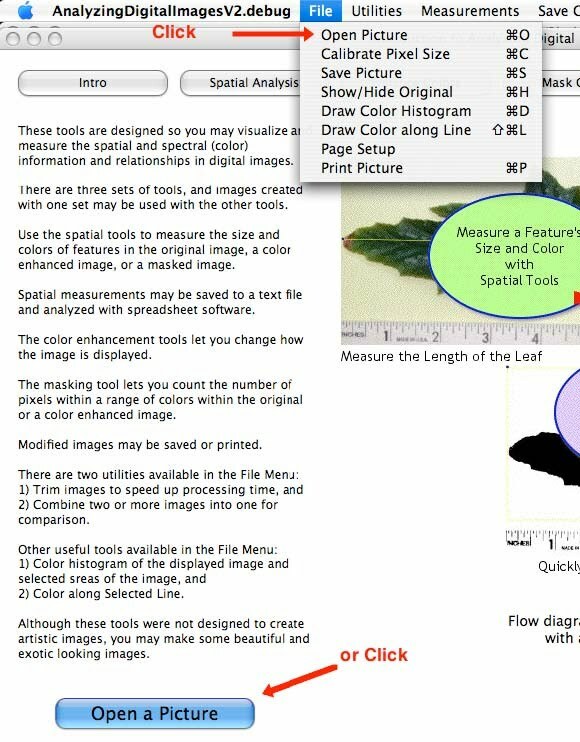 Start the AnalyzingDigitalImages software and open a picture by clicking on one of two options: “Open Picture” in the File menu, or use the “Open a Picture” button at the bottom of the screen. 1. 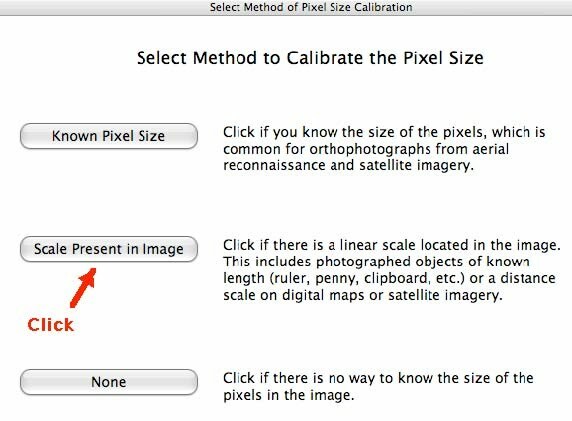 Before making any measurements, calibrate the size of a pixel* to the size of an object of known length that is visible in the image. This procedure automatically starts after you select an image. To run the calibration method again, use the “Calibrate Pixel Size” in the File Menu. * A pixel is the smallest portion of a digital image with uniform color. For most digital photos, the pixels are so small you won’t be able to see them. 2. Click and drag the cursor across the length of the scale. To adjust the ends of the line, either click and drag the blue or red end of the line or click the small arrows that appear below the image. TIP: Use the longest length possible since this minimizes small errors of drawing the calibration line. TIP: To make measurements with a centimeter scale, rather than enter “4” and “in” in the above boxes, type “10.16” and “cm” instead. Note: 4 inches x 2.54 cm/in = 10.16 cam. 3. TEST YOUR CALIBRATION: After completing the calibration, use the “line” analysis tool in the Spatial Analysis window to measure the length of the scale. If possible, measure a visible scale perpendicular to the direction of the first test. For example, if you used the length of a ruler to calibrate the pixel size, use the width of the ruler as the second test, if it is visible. If the calibration is incorrect, recalibrate before moving on—in the File Menu, choose Calibrate Pixel Size. 1. Make length measurements by clicking and dragging on features in the image. To adjust the ends of the line, either click and drag the blue or red end of the line or click the small Adjust arrows that appear to the left of the image. 2. If desired, Save values to a text file for use later with Excel or other spreadsheet/graphing software. To save measurements, use “Save Measurements” in the Measurements Menu. Besides the measurement, additional data are saved automatically to help check the quality of your measurements later. 3. Open a variety of images and see if you can make length/distance measurements in those images.